You always wonder how to increase interaction with your lovely customers, then gather more information from them in the most decent way. Here, BSSCommerce would like to offer you one of our useful products: Checkout Custom Field Extension Magento 2. 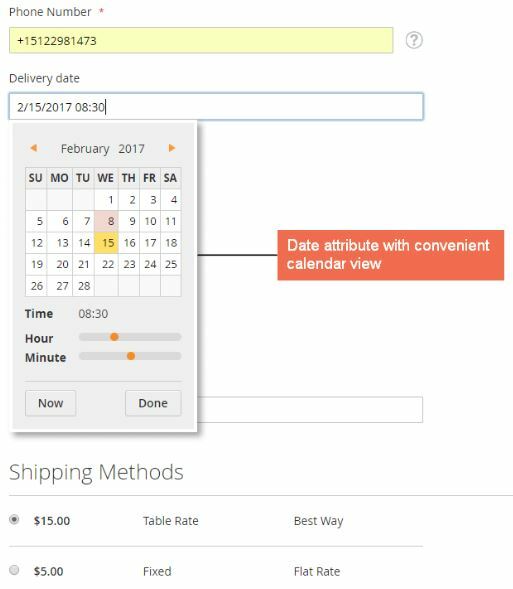 It is possible to inquire the right question at the right time, and in the proper way with Magento 2 Checkout Custom Field extension. 1.1 Does Magento 2 Default Support Checkout Custom Field? 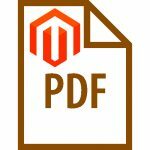 1.3 How Can Magento 2 Checkout Custom Field Extension Benefit You? 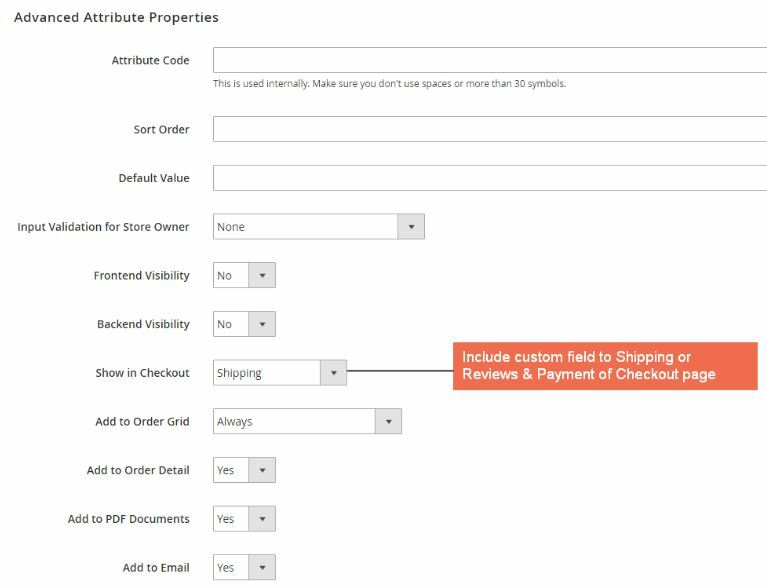 Magento 2 Checkout Custom Field extension allows admin to flexibly add as many as fields to the Shipping or Review & Payment section of Magento checkout page to collect information from customers during the checkout process. Checkout Custom Field extension for Magento 2 provides various input types for such custom fields. In addition, this module also displays extra information in Order Grid, as well as Order Detail, email and extract to PDF document to support order management. 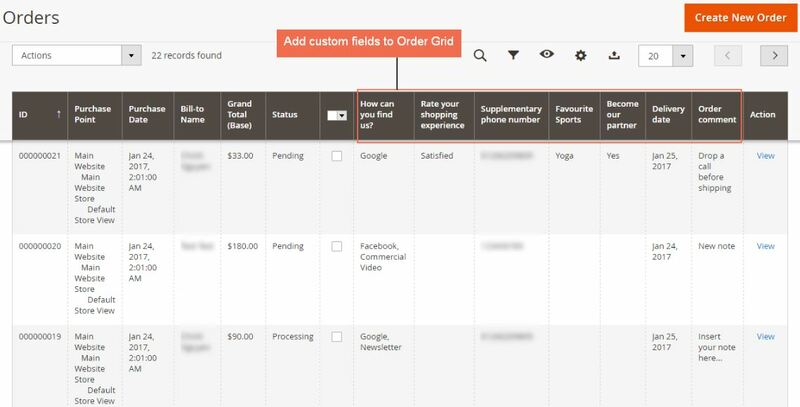 Magento 2 Checkout Custom Field extension enables admin to edit each custom field to display in each store view. And do not leave out our new update feature to get different attributes via API. Does Magento 2 Default Support Checkout Custom Field? Unfortunately, in Magento 2 default platform, there are unimportant fields that need to move out, such as middle name, fax, company, or postal code. 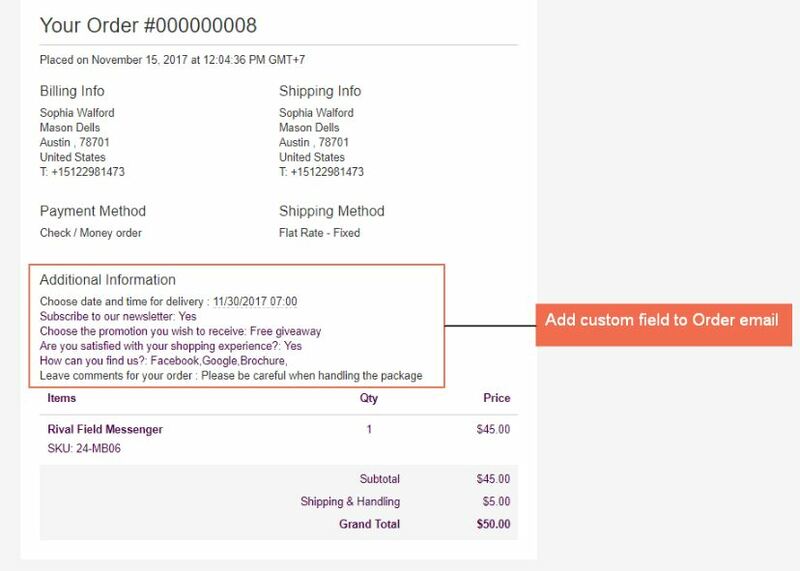 However, shipping section lacks some fields such as delivery date to determine when customers are available to receive the order, or comment field to leave notes for the shipper to handle the goods carefully. 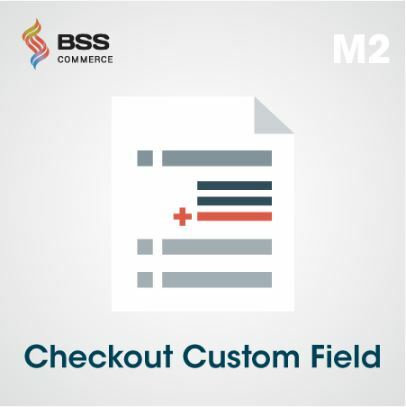 BSSCommerce introduces Checkout Custom Field with the view to fulfilling web owners’ need for a more informative checkout page. Create more custom fields using 6 different input types: radio button, checkbox, date & time, yes/no, text field, and text area. 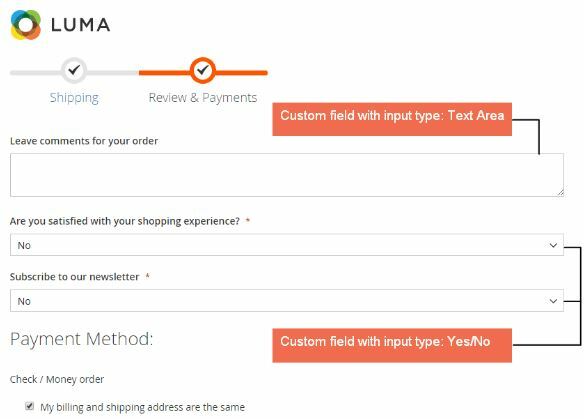 How Can Magento 2 Checkout Custom Field Extension Benefit You? 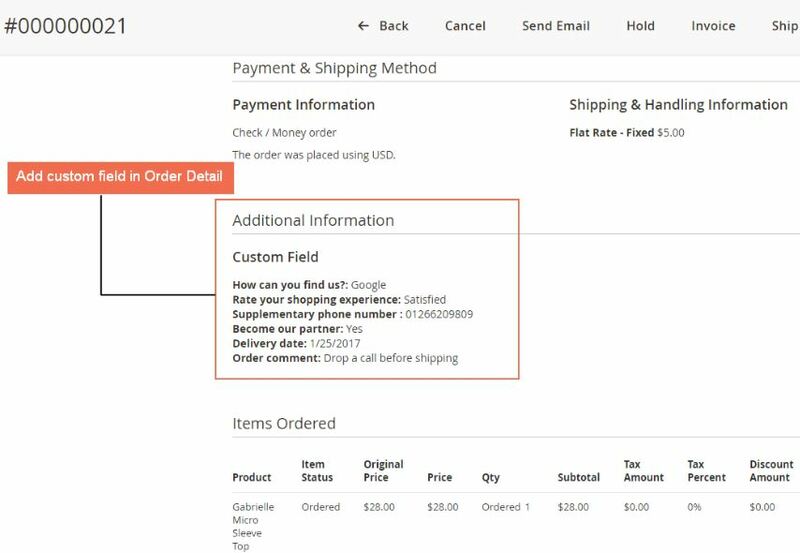 On the one hand, Checkout Custom Field for Magento 2 extension gives you a tool to collect deliberately more customers information in a courteous way by including suitable custom fields to any part of the Checkout page. 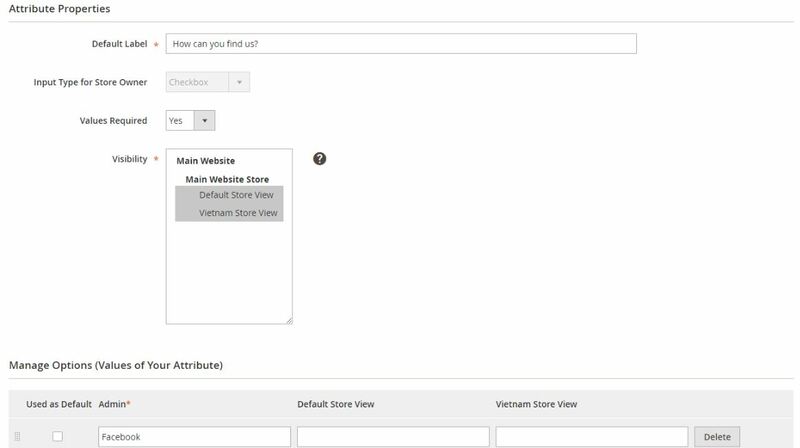 Admins have flexible ability to customize checkout page with various attributes in the backend configuration of Magento 2 Checkout Custom Field extension In the other hand, customers may feel more comfortable when visiting checkout page configured by Checkout Custom Field for Magento 2 extension as they can increase interaction with web owners to improve the quality of website and products. 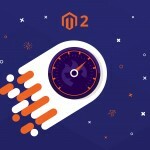 If you give it a try, you will be impressed by the outstanding features of Magento 2 Checkout Custom Field extension by BSSCommerce to gather more data from your customers for better products and services. You can explore Magento 2 Checkout Custom Field extension on the following admin page. Firstly, let ‘s have a general look at Checkout Custom Field in Store of Backend page. 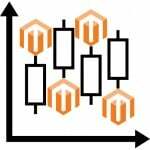 Next, we will go further on Checkout Custom Field Magento 2 extension management. Here, you may see the attribute grid with various custom fields in which you just need to click “Add new attribute” to edit extra fields as needed. In Attribute Properties, you are able to edit new fields with 6 different input types, choose whether the custom field is required or not, and which store view you want to show that field. 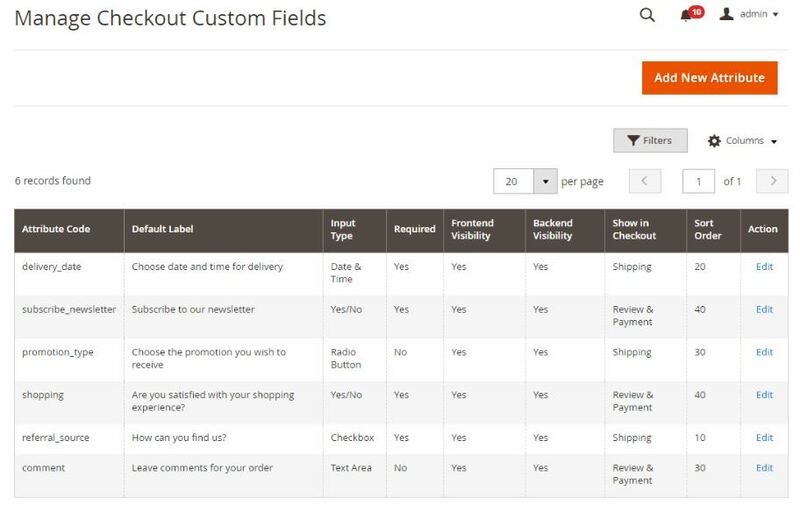 For more professional custom field management, let’s discover in Advanced Attribute Properties in Magento 2 Checkout Custom Field extension Backend Demo where you can design new fields for more attractive and convenient checkout page. For example, you can set the order of displayed fields, apply default value if needed, or choose input types available in each field, and so on. The same information is displayed on Order View Page. Admin can easily manage and check full information on PDF invoice, PDF Shipping & Handling information, etc. BSSCommerce would like to offer you the best successful solution to gain extra customer information, at the right time and in right way, with the additional fields. Magento 2 Checkout Custom Field is absolutely an attractive deal at only $79.00 for the great features of Community Edition. All our previous customers have rated 5 stars for the quality of Checkout Custom Field extension.